Audiolab 8300A review | What Hi-Fi? The Audiolab brand was established on the extraordinary success of its first product, the 8000A integrated amplifier. Back in the early 1980s, this slim unit struck just the right chord with hi-fi buyers – its combination of quality build, sensible features and highly neutral sound proved a massive success. The DNA of that original design has been retained through the company’s subsequent designs, including the 8300A on test here. However, this isn’t just some mild evolution. The 8300A is a completely new design that stays true to the original’s engineering principles and aesthetics, but takes in the advantages of current thinking in electronic design and technology. The core of the 8300A’s new electrical design is its 75W-per-channel dual mono power amplifier section. It is designed to be a highly linear, low distortion performer into a wide range of speaker loads. The numbers seem to confirm this, as that output rises to a claimed 115W into 4ohms and maximum current delivery is a notable 15A. This wouldn’t be possible without a properly specified power supply. This amp has a 300 VA toroidal transformer with a generous 60,000 uF of reservoir capacitance. Build quality is as good as we’ve come to expect from Audiolab. The casework feels solid and beautifully finished, in either the black of our review sample or silver. We particularly like the crisp edges on the aluminium panels and the precise feel of the rotary controls. We like the remote too, it’s a classy system controller that feels good to use. Around the back you’ll find line level inputs, including a balanced XLR option. There’s also an adjustable moving magnet/moving coil phonostage for those who use records. There are also two sets of speaker outputs to make biwiring a little easier. 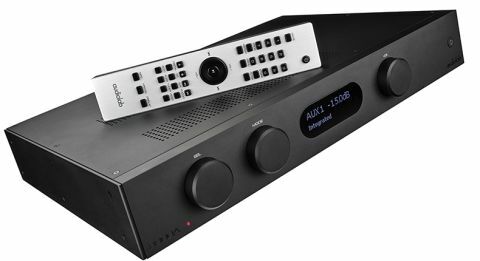 This is the first time one of the brand’s amplifiers has featured a display, which is useful for setting up the amplifier and making adjustments like phono stage gain or the length of standby mode. It’s large and easy to read, even from a distance. As usual with Audiolab’s integrated amplifiers, it’s a simple matter to separate the pre and power sections – useful if you want to use a superior external preamp or add more muscle through an outboard power amp. We give the Audiolab a few days of running before we start listening seriously. A claimed output of 75-watts per channel is relatively healthy, but it gives little indication as to how muscular the 8300A actually sounds. Listen to a piece of music with wide dynamic extremes, such as Hans Zimmer’s The Battle from the Gladiator OST, and this amp takes it all in stride. There’s plenty of punch and the kind of heft at low frequencies most rivals don’t get close to. The presentation is big-boned too, with a wide stereo sound stage populated with nicely layered, crisply focused instruments. We’re also impressed by the 8300A’s tonal balance. It’s as even as they come, refusing to add unnatural colour or drama to the sound. We listen to smaller scale recordings from the likes of Eric Bibb and Satie, and are impressed with the way this amp renders tonal textures. Its presentation is very clean too, as if distortion levels are way lower than the norm. Despite all this obvious talent we’re not totally bowled over with the overall performance. Compared with alternatives from the likes of Rega and Naim, the Audiolab is a little short in its sense of rhythmic drive. The 8300A doesn’t communicate the changing momentum of a piece of music as well as we’d like. That means the initial build-up of tension in The Dead Weather’s 60 Feet Tall isn’t particularly obvious. Similarly, the sheer energy and drive in OutKast’s Hey Ya! Is diluted, meaning a notable slice of the song’s sense of fun is lost. It doesn’t help that the amplifier isn’t flawless in the way it communicates low-level dynamic shifts either. Nina Simone’s vocals on the haunting Strange Fruit come through with less passion than we’re used to, while the steadily growing power in Arvo Part’s Tabula Rasa doesn’t have the impact we’d expect. The story is much the same through the phono stage. It’s a decent effort with low levels of noise and a good amount of insight, but also loses some of the solidity and authority of the line stages. Make no mistake; the 8300A is an amplifier that can impress easily. Build is excellent and its large-scale sound gives it an edge over many rivals. It just doesn’t have enough all-round sonic talent to gain an unreserved recommendation.